The Leader of Crawley Borough Council, Councillor, Peter Lamb, paid a visit to The Gatwick School in Crawley recently to see first-hand the progress of one of Crawley’s newest schools. Operated by Aurora Academies Trust, The Gatwick School caters for students aged 4-16 and it began life as a free school in 2014 with only 44 children on roll. Just 4 years later there are over 650 students and the school has waiting lists for places. Councillor Lamb was keen to see why the school has become so popular and he was not disappointed! Secretary of State for Education, the Rt. Hon. 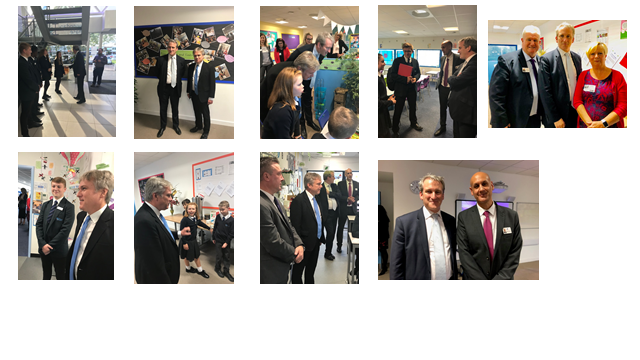 Damian Hinds paid a visit to The Gatwick School in Crawley this afternoon along with Crawley’s MP, Henry Smith. Operated by Aurora Academies Trust, The Gatwick School caters for pupils aged 4-16 and began life as a free school in 2014 with just 44 children. Just 4 years later there are over 650 on roll and the school has waiting lists for places. Mr Hinds was keen to see why the school has become so popular and he was not disappointed! Visits to classrooms were organised and led by some of the Student Leadership Team including the Head Girl and Boy from both the primary and secondary phases. Mr Hinds was extremely impressed with the standards of teaching and learning throughout the school and commented on the high quality learning environment and the engagement in lessons. Head of School, Mark Roessler said “Having such an important visitor to The Gatwick School has really created an energetic atmosphere and today there was a palpable ‘buzz’ around the school. Every student and every member of staff was keen to show off their learning and Mr Hinds was very receptive to that and spent a long time talking to our students and thanking members of staff for allowing him into their lessons. Aurora’s Director of Education and Executive Head Paul Reilly said “In our first inspection we were rated by Ofsted as being Good with some Outstanding features and that has really helped cement our reputation in the community. We are now becoming the school of choice for many parents who tell us that they like our all-through approach and the unique family feel that permeates the school”. I just wanted to write a very quick update on what has been a very positive start of term for The Gatwick School. I write this post with about a week to go until our children return to school. Teachers are all busy planning for their return and we are looking forward to welcoming our new Reception and Year 7 children into our school. As you may already know we were oversubscribed in our Reception year group and we offered the full allocation of 120 places in Year 7. This is very positve for the The Gatwick School and it is testament not only to the hard work and dedication shown on a daily basis by our children and their staff, but also highlights the support given from parents and our growing popularity and reputation within the community. For some parents this has been a 4 year journey, for other parents less time, but what strikes me is the commitment and enthusiasm by all to see this initial journey through and support the school in every step we take forward in order to benefit the children. Following my recent request for parents not to turn right when exiting the school, I am happy to inform you that virtually all parents are following left turn only procedure. This in turn is speeding up exit and reducing the build up of cars in the car park which is very positive for all. Thank you to parents who shared advice on Facebook and for supporting me in this request. The Gatwick School is pleased to be supporting the Manor Royal Careers Expo on 17th May at the Crowne Plaza in Crawley. This new event is free to attend and will highlight jobs, careers and training opportunities on Manor Royal. There will also be a series of workshops on apprenticeships, interview skills and working for Virgin Atlantic. TGS would like explore if we can enter a school team in the English Schools Equestrian qualifying events coming up in the near future. A Spanish website link posted to Google Classroom for Yr9 and 10, designed to encourage student reading via a Teen Spanish Magazine, has unfortunately been linked externally to an 'Ad Pop Up' which has inappropriate content attached. The Google Classroom post was immediately removed upon finding out about the Ad Pop Up. Congratulations to Year 7 Thomas who has recently qualified to compete (representing TGS) in the Regional National Schools competition held in Horsham later in the year. Every student (and quite a few teachers) ran a sponsored mile, we completed a non-stop circuit and had sporting challenges every lunch time ran by our enthusiastic teachers!